Susanna Leonard Hill: Would You Read It Wednesday #87 - Story Bored (MG) PLUS Straight From The Editor and The April Pitch Pick Winner! Would You Read It Wednesday #87 - Story Bored (MG) PLUS Straight From The Editor and The April Pitch Pick Winner! Yeah, so, the Can't Sleep Without Sheep e-book launch didn't go off quite as planned. Best laid plans, right? We have a jam-packed agenda today, so let's get right to it. Next, I get to announce the winner of the April Pitch Pick! The winner is Pam for Flood Dogs! Congratulations, Pam! Your pitch is winging it's way through cyberspace to editor Erin Molta! And congratulations to all our other brave pitchers who put forth excellent work! I love this new system we have of revising pitches before the pitch pick. Everyone makes such improvements - it's wonderful to see. And you all have such great ideas for stories! Next up, we have Straight From The Editor for Erik, our March Pitch Winner. Super Crime Stopper Tomato and his sidekick Pea chased super-villain Wintergreen onto a rocket ship. But Wintergreen blasted off, they crash landed on the planet EAR-TH and now these perennial enemies must work together to survive dangers such as toxic sheep (or caterpillars or cows – something to add humor and imply that these are aliens) and find a way home to planet Oarg. Finally, we have today's Would You Read It! Today's pitch comes to us from James. James Radke is a medical writer who writes about and/or for children with medical conditions at www.raredr.com and www.wordpharm.com/comicmeds.html . And sometime he just likes to dissect the book world in his stories and leave the medical world alone. As for today's pitch, it's a maybe for me. I like the idea of trapped fairytale characters, and a kidnapped writer, but there are a couple of things that could be clearer. It sounds like "the narrator" is the main character and so I wanted a better idea of who he or she is. Why can't the narrator character rewrite the story, I wonder. And how did the boy (name?) come to rewrite it, does this story involve magic? Hope my comments help. Thanks for sharing your thoughts for James, Andrea - I'm sure he'll find them helpful! Sounds good to me....a complicated mystery/adventure story that includes lots of old favourites. I love the idea of someone being trapped in story books. It reminds me of Roald Dahl's book "The Witches" when the children get trapped inside the paintings. However, I am a bit confused as to who the main character is. Is it the narrator? Is it the boy writer? 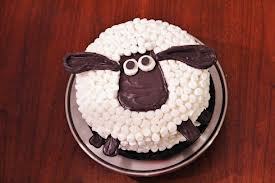 Love the sheep cake! Erin's comments for Erik are super and i love the premise of the pitch. I agree with Andrea that there is nothing in our eyes stopping the narrator from re-writing. Unless the narrator is held hostage lol. It's hard to take my eyes off that gorgeous cake. Now that's a work of art! I was confused by James' pitch. I know someone is trapped, but I'm not sure why I should care. Perhaps he could make the stakes clearer? And I wouldn't use the word "bored" in the title. OK, I'm a bit of a grammar witch, and "did the changes" should be "made the changes." And wouldn't Humpty Dumpty be in the cake itself, rather than in the recipe? Why is there no tortoise? But all these things could be fixed, and I always love "trapped in a book" stories, so I'm going to give it a yes. Grammar tips are always appreciated. Thanks Deborah. As for where to stick Humpty Dumpty....he is a book character so he has to go in the cookbook (recipe) instead of the cake. Its my attempt to be logical in this illogical concept. Thanks for reading the pitch and the comments. I like the idea of a writer being kidnapped and held hostage within the book(world). And the old shoe lady's aspirations toward wealth, the lack of a running buddy, and eggshells in a cake recipe. Maybe the boy can have a name? that would make it easier to sort out all those writers at the end. And how did those books get changed, anyway? 1. That cake looks FUN, FAB, . . . and FLUFFY. 2. Sorry that the e-launch didn't go according to plan. 3. The jingles have been a delight to read/watch. 4. Erin's comments are always helpful. 6. I think the pitch sounds interesting. This pitch seems a little long - starting out telling what is NOT the problem. But, I'm a yes. I would read it. Playing with familiar stories is fun. I'm also wondering how the narrator and the boy are connected? Friends? Brother and sister? I'm bummed for you that the ebook launch didn't go off without a hitch, but know that it is totally worth waiting for! The cake is fabulous! Reminds me of the sheep in "Wallace & Gromit: A Close Shave"...LOL! Congrats to Pam for winning the pitch pick! And terrific comments from Erin! I think James' story sounds interesting and it is probably something I would read (because it sounds like a fractured fairy tale). However, I don't think editors would like a synopsis that starts off with "the narrator." It sounds so dry and clinical (I enjoy reading dry science articles in professional journals, but not in a novel). Also if "none of those things are the real problem," then don't mention them. Get to the nitty of the main cord of the story. James' story has a fascinating premise (the reader is two steps removed from the MC, filtered by the perceptions of an anonymous narrator) but it is a difficult one to get across in just a few lines. I hope I'm not too blunt...I attended an amazing query critique session by Jill Corcoran this past Sunday and she rubbed off on me a little. LOL! She's terrific but oh so blunt. Also, this will need to be shortened by a good bit (so take out the extraneous stuff). But, overall, I think James has a gem of a story idea here so please do keep working on it! Okay, now I get it. The narrator of THIS story has learned that the original fairy tales have been changed by an eight year old author. This sounds hilarious! It's a definite yes for me! However, the last line isn't needed. Love, love the idea of needing another writer to rescue the original author. Like the idea that the narrator is the first to recognize there's a problem on his bookshelf. Not unLike my comment, the pitch is too long. So much good stuff, I don't want to say what should be deleted. Maybe after the Old Lady name change (which needs shortening), just say, "and other changes" or "and that's not all" or something like that. By now, we get the gist. Still, I know this is going to be a really good laugh out loud read. BTW, Susanna, that cake looks soooooo good. I think I may need to make a Publix run to their bakery dept. You're exhibiting great patience with your e-book. I would be crawling the walls! Proud of you, Susanna! Congratulations to Pam on winning the pitch pick! Erin's comments to Erik were helpful...especially since she actually gave what she felt was a 'perfect pitch' for that story...and CONGRATS to Erik who will be participating via Skype at the Asian Festival of Children's Content later this month!!! James, I am definitely intrigued with your story idea...I haven't read the other comments, but I would say that you might want to tighten the pitch up. After changing the content in every story on the shelf, boy writer (his name) goes missing - rumor has it that he is being held in a book. Can they find a writer to rescue him - or will (boy writer's name) be trapped between the pages forever? I want a piece of that cake really bbbaaaaadddd! I love chocolate, and I love marshmallows. Susanna, I do hope the E-book becomes available soon. I feel badly for you! You had this wonderful hare-brained promotion and then a glitch!!! Congrats to Pam!!!! And how nice it is to have Erin's input on pitches every month...a real learning experience for us! James, I can tell from your pitch that you have a fun idea. The pitch does need polishing. I didn't read all the comments in detail, but as I scrolled down, I saw that one person suggested you begin your pitch with something more interesting than "The book narrator has a problem." I agree with that. You are telling instead of showing. Move right on to the problem in your pitch and tempt us to grab that book right off of the shelf and take it home. thank you for the kind words and the great ideas for polishing it up for the next draft. Yes, I'd read the book, but the pitch is quite long.Maybe not have SO many what's-wrongers (maybe take out the Humpty Dumpty one - It took me a bit to understand that?)? I have to be honest and say it took me a few reads to really understand this pitch. I think it is too long and not concise enough. However I do like the 'trapped inside a book' storyline and think it definitely has potential as a story. Thanks for your suggestions for Mr. Radke, Erik. And fingers crossed the digital glitch will be sorted out soon for CSWS! I'm glad you enjoyed the jingle contest, Vivian - yours was such fun! :) I hope the glitch will be worked out soon - I'm sure Bloomsbury is anxious to get it fixed too :) Glad you found Erin's comments helpful, and thanks for your helpful suggestions for James! Thanks for bumming along with me, Teresa :) Glad you like the cake, too. And thanks for your very thoughtful and helpful comments for James! Thanks for your thoughts for James, Genevieve - very helpful, and good questions! Congratulations again, Pam! It was a good pitch :) Help yourself to cake, and thanks so much for your helpful comments for James. Sisters Grimm was very popular in our house too!